All transactions are safe and secure with a reliable history in online purchasing behind each of our associates. 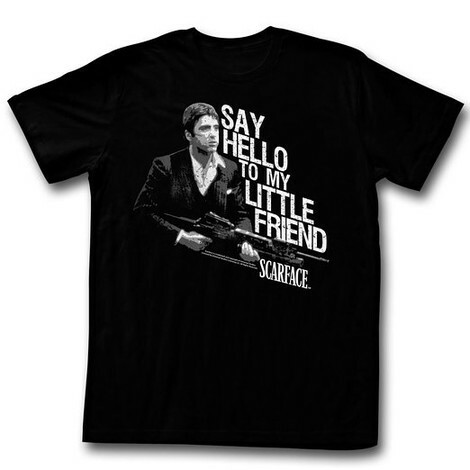 Buy the Say Hello to My Little Friend t-shirt to own Scarface clothing and merchandise. It's the most repeated Tony Montana quote from the movie, which he delivers at the end as he makes his final stand. Relive this classic moment in cinema history with this cool Scarface tee that celebrates the movie by displaying the main character's quote on the front of the shirt next to the man himself holding a machine gun. Who hasn't harnessed the power of this scene at some point in their lives, exclaiming in their best Cuban accent, "Say hello to my lil' friend." In addition to the Say Hello to My Little Friend tee above, browse the Scarface Clothing Gallery for more apparel like men's and women's clothes, kids shirts or hoodies.